Finding dinner for under a tenner in London is a challenge. It’s not impossible, but it’s rare to come by a restaurant that isn’t a fried chicken joint and can offer you change for a £10 note. Certain cuisines always pop up when on the hunt for cheap eats, and a good curry house often makes an appearance. 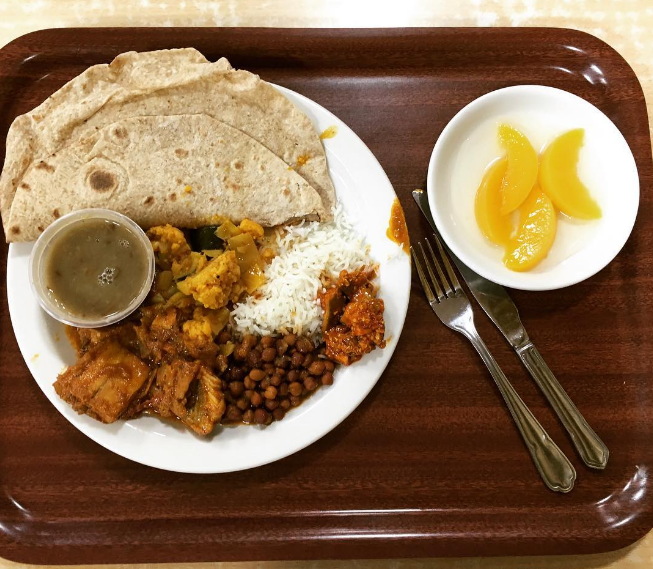 Sticking to Indian cuisine but with a slightly different take on the style of dining, last week some friends and I headed to the Indian YMCA in Euston to try their canteen. 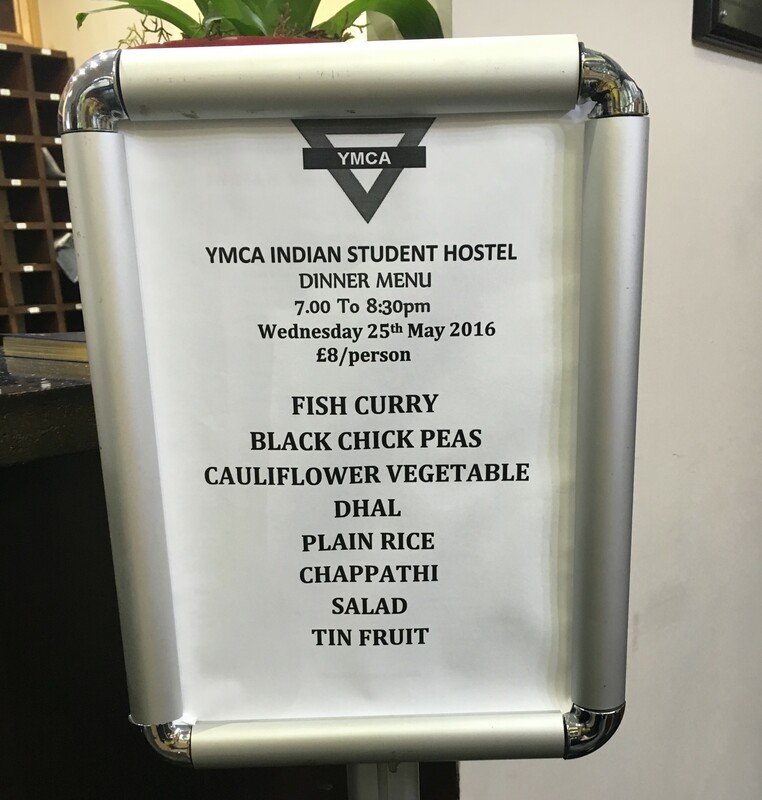 The menu at the YMCA – who says students eat badly?! I read about the YMCA in a Time Out review and since having returned from Sri Lanka last month, I’ve missed my daily dose of dahl and rice. The Indian YMCA canteen is open to the public, who are required to buy a dinner (or lunch) ticket before eating. This ticket is then handed over at the till before serving yourself from the small buffet selection of currys on offer, accompanied by a green salad, rice and roti. As long as you finish your plate, every guest is welcome to fill up as many times as they want. I wanted to try it all first round, so loaded my plate with the three curries on offer: chickpea, cauliflower and fish. In true school canteen style, dessert is the very old school sweet of tinned fruit – not quite a pudding in my book, yet the idea of dessert mixed with school memories left me longing for a jam roly poly in bright yellow custard. Still, the unlimited warm milky tea on offer was well received. As pudding is more of a novelty gesture than a real dish, more time can be spent exploring the savoury dishes on offer. The chickpea curry had a great texture; the chickpeas had retained their bite while still absorbing the subtle curried spices. The cauliflower curry was a favourite with my friends, although in my opinion it passed into quite a generic curry genre for me – vegetarian with not enough spices or interesting flavours to write about. Not bad at all, just not as strong a contender compared to the fish curry, which had meaty white fish fillets with the skin on, bathed in a thick, slightly sweet tomato sauce. This made the perfect filling for my hybrid fish roti burritos rolls, which I feel could surely be the next big food fusion trend. Comparing Sri Lankan and Indian cuisines may seem like a sweeping racial generalisation, but they do share a lot in common. Dahl, as an example, is a traditional dish to both countries. On this account, though, it’s safe to the say the Sri Lankan versions I had tried were far superior. More of a soup or accompanying sauce than anything, the YMCAs dahl is liquidy without much bite. Is the Indian YMCA going to be the best curry of your life? No. Is the Indian YMCA a great place for a cheap dinner, with a nice friendly environment and generally good curry? Absolutely. So go, fill your plates and stomachs with some Indian canteen food for less than the cost of two London pints. Moving away from the small town of Ella and onto Sri Lanka’s second largest city, we reached Kandy, the capital of culture. The city centers around a large lake and on the lake’s edges stands the impressive Temple of the Sacred Tooth temple, home to a molar from the mouth of the very Buddha himself. Eager to get our own teeth into some of Kandy’s culinary offerings, we hunted down the central market. A mix of meat, spices and more teas than I had ever seen before, friendly stall owners invited us to smell and sample their goods, with many enticing Ayurvedic beauty products too. We stocked up on spices, buying sweet cinnamon bark in bulk and sniffing our way around the huge array of curry mixes on offer. After spending what felt like hours in the whirlwind of smells and sights within the market, we moved onto a popular local spot for lunch. The Kandy Muslim Hotel is not a place offering accommodation and is not particularly Islamic either. No religion, or lodging, but instead, some of the best food in Kandy, eaten in a busy café right on the main road. Serving buttery, pillowy roti breads with sweet and creamy cinnamon dahl, customers quenched their thirst slurping down avocado lassis and fresh lime juice while selecting from a pick and mix of savoury pasties and bread being brought round to each table. Famous for its kottu, a dish of day-old roti, finely chopped and cooked with vegetables and meat on a hot plate, we ordered three portions. Three portions were enough to feed a family of six, and despite all the willing in the world, I was defeated. Not too quickly, though…I still made an impressive dent in this dish, which was a textural mix of soft and crispy roti strips, combined with golden roasted chicken and vegetables. One of my favourite things about Sri Lankan food is their style of eating. I envision the ‘one pot dish’ to be a crime in their eyes, as each meal I ate came with at least three dishes, all made to be mixed and eaten together, shared amongst your other dining companions. This culture of mixing various plates comes to its absolute peak at the almighty curry buffet. In truth, with a tendency to cook large amounts and such a variety of dishes, almost every meal in Sri Lanka was like a buffet. It’s really just the difference between a Sri Lankan and a greedy Brit that earns these meals their ‘buffet’ title. Being the aforementioned greedy Brit, I reached a true glutton’s paradise at the infamous Sharon Inn dinner buffet. Contradicting the age-old buffet mantra ‘quantity over quality’, every single dish on offer was delicious in its own way, a feast of flavours, textures and food types. Smooth, velvety chard with desiccated coconut sat next to a slow-cooked and richly spiced dish of jackfruit, a fruit that when cooked takes on an almost disconcertingly lamb-like appearance, soaking up the intense curry flavours of turmeric, chilli, cinnamon and cumin flavours like a greedy, fruity sponge. Aubergine came cut into fine julienne strips, cooked in a sweet and sour style sauce which was sticky and dark, contrasting with a bright yellow mango curry which was light and tangy. Radish and banana leaves featured in curry dishes too, as well as green beans and yellow peppers. Fresh naan and hoppers were brought out throughout the meal, and I made a sterling effort to squeeze them in alongside the other twelve dishes on offer. Vegetable curries completely stole the show, leaving little need for the one token meat (chicken) dish on offer. This is a point that bears repeating; Sri Lankan cuisine is a dream for vegetarians. With such inventive use of all fruits and vegetables, Sri Lankan food is bursting with options for a meat-free diet. Yet despite an abundance of meat-free meals throughout the trip, we ended our holiday with a seafood feast. Back in Colombo for our final night before the flight home, we paid a visit to The Ministry of Crab. Highly regarded as one of the best restaurants in Colombo, there’ll be no prize given for guessing their speciality. Crab is, of course, their dish of the day, with customers choosing the desired size of their crustacean for consumption. You are then a given the option of which sauce you’d like it cooked in. Having eaten a fair amount of spice over our trip, we veered towards a garlic sauce without chilli. Garlicky enough to keep vampires at bay but not a touch too much, the garlic flavour melted in with mounds of extra virgin olive oil and together this mix of flavours sat perfectly on top of the crab. With an enormous crab to share, naturally, we felt the need to order yet another dish. The prawn curry came with impressive, almost lobster-like king prawns, cooked in a coconut curry sauce and served with freshly baked slices of bread. The prawns had a perfect, firm texture, yet for my very last meal on this earth, I may well just request a load of bread and the sauce these prawns were cooked in. A mix of coconut, large amounts of oil, gentle curry spices combined with lots of garlic and soft onions made for an all-around blow-out of a dish. All in all, I could not have asked for a better holiday. Two weeks was a wonderful amount of time to travel around, and while we by no means covered the whole country, we managed a relaxing and fascinating mix of city, culture, beach and nature. To anyone thinking of going to Sri Lanka, this is a country with so much to offer. So go travel, eat and cook, and try for yourself all the incredible tastes of Sri Lanka. A country’s cuisine is an insight into so much more than just what people fancy for lunch. It’s a glimpse into a culture’s daily routines and rhythms; is lunch a quick sandwich inhaled in front of a computer screen, or a two-hour, two-course affair, leaving time for an afternoon siesta? Sri Lankan meals are never a quick one-pot affair, with various dishes and sides present in each meal. Looking to learn the recipes and techniques that make up Sri Lankan cuisine, we donned our aprons on and took a Sri Lankan cookery course. On a Lonely Planet recommendation we chose a cookery course in Unawatuna, a little beachside village just 10 minutes away from Galle, the colonial town we had headed to from Colombo. Leading the class was the extremely charismatic Karuna, who has been running the course since 2004. 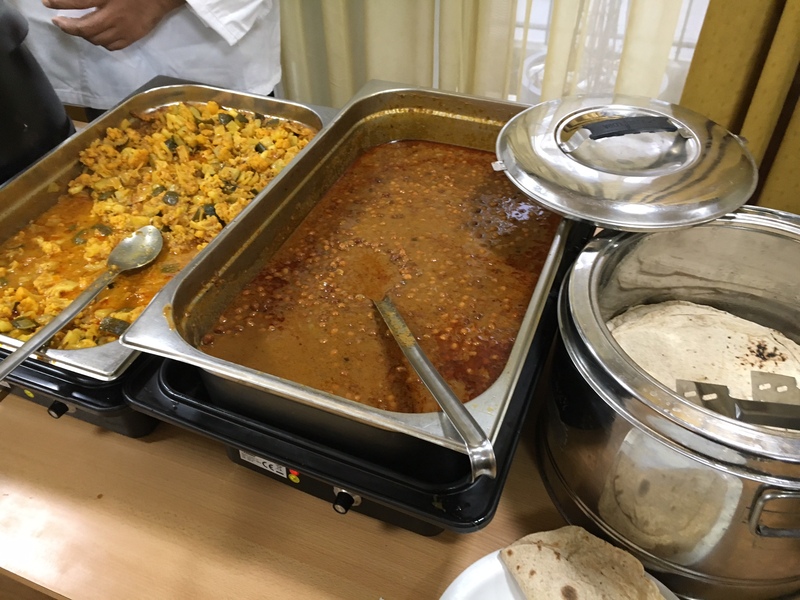 Having read lots about the course, and Karuna, I knew what to expect – a trip to the market, the chance to make an array of traditional curries, and the experience of Karuna herself. Chatty, smiley and an absolute domestic goddess, within ten minutes of meeting her she had her arm around me and was already bossing orders. I felt like Karuna and I would really get on. Picking up our ingredients in the market, I saw vegetables I didn’t even know existed. Round baby aubergines? Well I never. Leaving the market, we stopped off to buy some fresh tuna. Never one to be squeamish, the sight of a man driving a machete into this enormous tuna fish’s head had even me looking away. We made an impressive 7 curries in total, each using a similar blend of curry and pandan leaves (pandan is similar to lemongrass) and various spices. Each curry contained coconut milk or cream, which we extracted ourselves from just one coconut. Once split in two, the coconut flesh is then extracted out of the shell and then twice drained through a sieve with water; once to obtain the coconut cream, and a second time to get the milk. Coconut admin out of the way, we could start preparing our many curries. The tuna curry was our spiciest, with an intimidating two teaspoons of chilli flakes. Karuna ignored my pleas for a milder version and continued to add in a handful of baby green chilis. She told me if I didn’t like spice, I just didn’t eat the chilis. Fair enough…and what Karuna says, goes. – They all have a lot of garlic. Want to cook great curries? Don’t scrimp on the cloves – all of the dishes we made contained at least 6. – Revelation: you don’t need to soften or cook the onions first. Honestly! We just mixed all the ingredients in a bowl with its liquid (either the coconut milk or cream) and then put it straight in the pan. A time saver or what? – Garam masala, turmeric, salt, ground black pepper and chilli are your key flavours. – Fresh curry leaves are amazing. All recipes had at least 10 in, shredded roughly by hand. Pandan leaves are also incredibly fragrant, but if you can’t find them, opt for lemongrass instead. Without further ado, here is my favourite curry recipe from the day. Serves 4 people as a side dish, 2 as a main. – Mix all ingredients together. Cook in 3 tsp of oil (sunflower/vegetable/coconut) and simmer for 10 minutes. After 10 minutes, add in 2 tsp sugar. Stir, simmer for 5-10 more minutes*. *If you’re going for the chicken version, make sure you’ve cooked the dish for at least half an hour, and that no flesh remains pink! Not one to blow my own trumpet (and of course this plate is due mainly to Karuna’s knowledge in the kitchen rather than any skill of my own), but this meal was one of my favourite of the entire holiday. This huge mix of flavours on one plate meant every mouthful was exciting, with different tastes in each dish, from the sweet pineapple right through to the spicy, meaty tuna fish. It was incredible how every dish was so unique, despite all of them using a similar mix of spices and herbs. If anybody is eager to know any of the other recipes we made, feel free to drop me an email and I will happily share them with you.